He says working for television was so much fun he forgot about writing until he read Phillip Pullman’s, The Golden Compass and realized that “all” he wanted to do was write fantasy novels for children. (thought he still misses the golf carts). 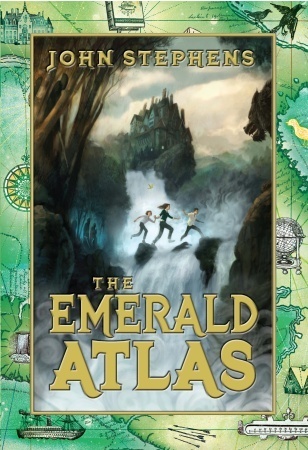 The Emerald Atlas is the story of three very special children whose parents mysteriously vanish when they are young. One night when she is four, Kate’s mother slips into her room and insists that she promise to care for her younger siblings, Michael, two, and Emma, one. The three children are hustled to a waiting car driven by an elderly man who barely eludes magical pursuers in a chase reminiscent of Harry Potter. After ten year of ever more awful orphanages where they never seem to fit in, the children are sent to an apparent “last stop,” facility in Cambridge Falls, New York, run by the mysterious Dr. Pym. Dr. Pym, it turns out, is the wizard who had taken the children for safekeeping ten years earlier, to keep them from the grasp of the beautiful but evil witch who calls herself, the Countess. The forces of both good and evil are interested in Kate, Michael, and Emma for they each have a magical bond with one of the three Books of Beginning, where the great wizards of old in Alexandria encoded their lore when the worlds of magic and humans began to seperate. Kate’s affinity lies with the first book, The Emerald Atlas, which enables one to travel in time and space. When they stumble upon the volume in Dr. Pym’s basement, Kate, Michael, and Emma are whisked into the past before they understand the powers they have awakened. They become separated and fall under the power of the Countess and her minions. There’s a lot to like in The Emerald Atlas. The characters are nicely fleshed out. Fourteen-year-old Emma, clever, brave, with intuitive understanding of magic, suffers under the burden of keeping her brother and sister safe, as well as the other children of Cambridge Falls. Twelve-year-old Michael, who sometimes drives his sisters nuts with his camera, notebook, and bent for scientific experiment, has the thrill of his life when he meets real dwarves, the people he admires more than any other. Eleven-year-old Emma is the feisty one – part of the reason they’ve been shuffled from orphanage t0 orphanage is Emma’s habit of mouthing off to prospective adoptive parents. The three are desperate to locate their real parents and and learn who they really are. The value of loyalty and family runs like a constant thread through the book, even through Michael’s betrayal and forgiveness, which is reminiscent of Edmund in The Lion, the Witch and the Wardrobe. This is the sort of book, like the Narnia tales or Harry Potter, that will appeal to readers of all ages. With the cinematic sense of its author, I won’t be the least bit surprised to see it made into a movie. Stephens said, in his Amazon interview, that none of the studios have contacted him yet, but I suspect it is only a matter of time. I will certainly buy a ticket, just as I expect to read and enjoy the next two books of the trilogy. This entry was posted in Authors, Book Reviews, Characters, Fantasy, Novels, Writing and tagged authors, book reviews, fantasy, fictional characters, imagination, Novels, writing. Bookmark the permalink. Thanks for the review, Morgan. I think I just found something for my grandson’s summer reading program. I hope he’ll let me borrow it when he’s done.